Does my child need boots to ride horses? : Kids should have proper footwear, and I truly prefer kids to wear boots with a heel. If you don’t own a pair, we have a boot program here at the barn. For $20, your child can buy a pair of used boots and wear them until they don’t fit anymore. Then, if the boots are still in good, wearable condition, you can trade them in for a larger pair of boots for no extra charge. Do you provide Helmets? : Yes! We provide helmets of all sizes for loan at no cost. Can I wear my bike helmet? : No. The profile line is completely different, so we always use helmets that are specifically meant for equestrian sports. What if my child doesn’t want to wear a helmet? : Either we convince the rider to wear a helmet or you’ll need to find a different barn. We value safety here, and it is of utmost importance that every person on a horse, whether a child or an adult, wear a helmet at all times while mounted. Every ride, every time. What kind of clothes should my child dress in? : Long pants are required for every lesson. If the rider dresses in shorts, we will either cancel the lesson or will do an unmounted (non-riding) lesson. Jeans are a good idea, but sweatpants and yoga-type pants work also. In the extremely cold weather of winter, snowpants can be worn over regular pants. Where do you ride? : We have an indoor and outdoor arena as well as Daisy Meadow. The Meadow has low cross country jumps as well as a trail around the edge where we can trail ride. It’s safe to say we can ride in all weather. The indoor arena is insulated, so it’s a lot more comfortable in the winter than riding outside. We ride outdoors in the spring, summer, and fall, but we use the indoor arena for beginner lessons and rainy or cold weather. What kind of horses do you use? 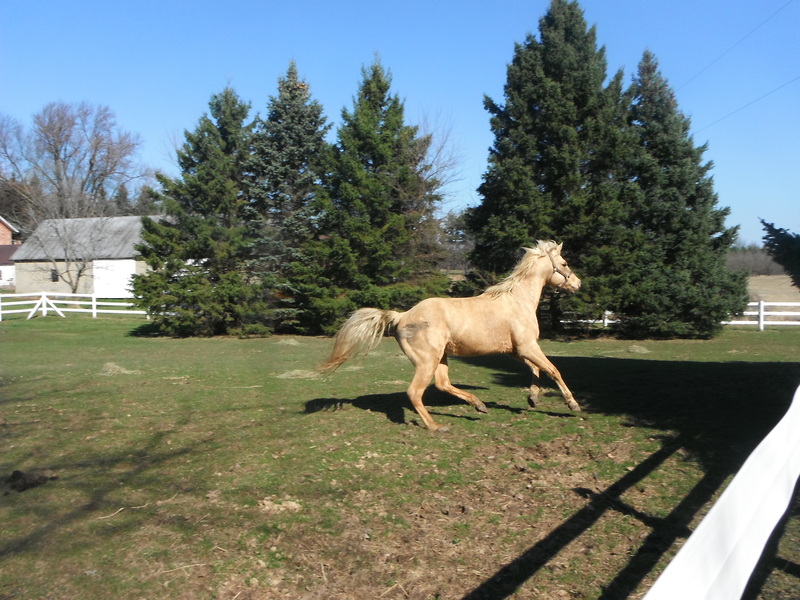 : We use Quarter Horses, Paints, a Haflinger, the ONLY known Teacup Friesian in the entire world (because we made up the breed! ), and a lovely Tennessee Walking Unicorn (You may not see her horn, but we know it’s there.) Our horses have been used for lessons, camps, shows, and pony rides for years. They are kind, respectful animals. Which way do you ride? : We do everything here at the beginner and intermediate levels. We jump, but never (for lesson students or at camps) above 1’9″. We do western gaming, but only at a canter, not a gallop. We do sidesaddle, but not competitively. My dressage horse can do tempi changes and pirouettes, but we don’t show. We drive our horses in lessons, but from the ground only–without a cart. So, what do you actually do at your barn if not compete? : Have a lot of fun with our horses and play with them! We love horses and want them to be as happy and relaxed as possible. We want to have our horses see us and come toward us as buddies–not see us and run away. What if I scheduled a lesson and need to cancel? There will be no charge. I do NOT charge you for ANY reason for missing a lesson. Life gets busy, kids get sick, and the weather here in Michigan is unpredictable. Do you cancel for inclimate weather? Yes. If the actual temperature or windchill is below zero, we cancel lessons. If the temperature or heat index is above 95 degrees, we cancel lessons. We also cancel in thunderstorms or hail. We have an indoor arena, so we can do lessons year ’round. Shoes are $90 to put on a front pair of shoes; hind shoes are NOT allowed at Firefly Farm unless they’re made of plastic. I switched to using Vaughn Parrish as our farrier after having a few incidents with various others. He shows up on time, takes great care of the horses, and is patient. There is no holding fee if you have your horse trimmed or vaccinated with the rest of the barn. There is no charge for barn-scheduled trims or vaccinations only. You should arrange times and payment ($10 per hour if over an hour, or $15 per session) with me if I must hold your horse for a personal need beyond that of the rest of the barn. We refuse to eat by-products, so we don’t feed by-products to our horses, either. We feed Ultium Growth, Ultium, Purina Senior, and Purina Healthy Edge Senior. We’re happy to supply up to 6lbs of grain per day for your horse. If you feel more is necessary, there will be an extra charge. We feed our horses supplements from Smartpak, and they’re all shipped together. In order to be a part of our “Buddy” shipment, please contact the company to let them know to ship your supplements here. I don’t mind if you wish to have another company ship supplements directly here–they can be waiting for you at the supplement counter in the barn. (Yes, we have a supplement counter in the kitchen for preparing your supplements.) If you do not get Smartpaks, we ask you to package up your supplements in small, labelled containers that are easy to open and put into the food each day. There is no cost for feeding this type of pre-packaged supplement. Liquids can be contained in small bottles. If we must scoop the supplements for you, there is a $10/month charge. If your horse becomes thin, please tell us immediately. We can increase hay and/or grain, add rice bran or soybean oil (as a supplement you provide,) feed him/her lunch, or keep him/her in a stall in the morning or evening for an extra time while they eat. Healthy horses should NOT show ribs if they are under the age of 25, and even then, I don’t like to see ribs on any horse. We strive to keep weight on your horse and make this the least-stressful experience possible. My horses are well fed; yours will be, too. We have plenty of pasture that we rotate and drag frequently to keep parasite counts low. In the field during the fall/winter/spring, each horse is given 2-5 flakes of hay in the morning and in the evening. On especially cold days or days that are difficult on the horses (wind, rain, hail) we frequently will give an extra flake to each horse during daytime hours. Our hay comes from a variety of sources, but it is all orchard or meadow grass hay without alfalfa. As far as I’m concerned, feeding moldy hay to a horse is like feeding rancid meat to a child. You just don’t do it. If you ever see moldy hay in my barn, I expect you to tell me immediately. The bales will be dealt with in an appropriate manner. If you are interested in having lessons on your horse, I will gladly teach you. Lessons for boarders, on your personal horse, are $30/lesson or 4 lessons for $100. Training is $60 per week in addition to board. Unfortunately, you are not welcome to bring your own trainer. We’re happy and relaxed here; we want to keep it that way with horses who feel safe, respected, loved, and secure knowing consistent handling techniques. We have a shower and bathroom available for your use in the tackroom. Feel free to take advantage of it–that’s what it’s there for! People have busy schedules and busy lives. You should not leave the barn smelling like a manure pile. We’ll provide the shower stall, towel bar, and hot water–but you have to supply your own shampoo and towel. We have a kitchen with a full-sized refrigerator, a sink, and an oven. Need to eat before you head off to work or class? That’s not a problem here. Please label any food with your name and the date before you place it in the fridge. Labels will be provided for you. Food over a week old will be removed and thrown out. If something is wrong with your horse or you see something of concern to you, please let me know. Speak to me in a calm, relaxed manner. We’re all here because we love horses. Drama, gossip, and rudeness have no place at our barn. People who show any of the three aforementioned traits will be asked to leave. I can not find your email or contact us anywhere on the site! Please email me! I’m sorry–it’s RideFireflyFarm@gmail.com or RideFireflyFarm@hotmail.com.